Product Overview This is the original and still the only studio unit dedicated to just adding valve produced harmonic distortion to sounds, with no solid state components in the way. This unique unit has changed little since its introduction in 1998. • T gives the typically "musical" effect found with triode valves and is good for just "warming up" a sound. • P1 means that the "distortion" valve is switched to Pentode mode to add odd harmonic which make the sound more aggressive, but retaining that valve character. • P2 is the "No Holds Barred" setting and is very unusual way of configuring an unusual valve, even giving an extra octave at higher bias settings. • The Bias control varies the current through the "distortion" valve (6AS6 type) and this current is shown on the milliameter. At low current the Vulture is "starved" and the sound is inclined to be thinner and "break up" easily. High current and the Vulture is over-fed and becomes quite fat and bloated. At medium current (0.25-0.3 mA) it distorts least, and this is the best setting for just "warming up" a sound. When the Vulture is over-driven, the meter may "twitch" and this gives a good indication of how drastic the distortion is. 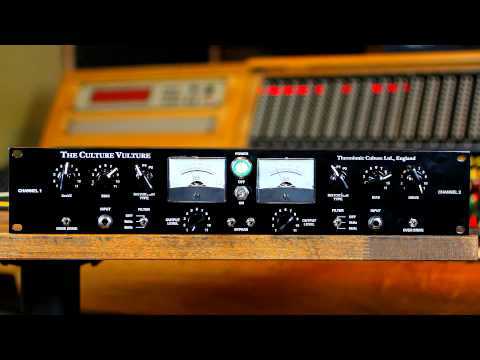 The Bypass switch completely bypasses the unit so that the Culture Vulture's effect can be accurately compared to the original. Features • The original and only all valve rack-mountable distortion/enhancer.